SlugFest Games - RulesFest: Keep Your Drink Deck Slim! RulesFest is a blog where we go over a few of our design choices as well as cover the occasionally missed rule. 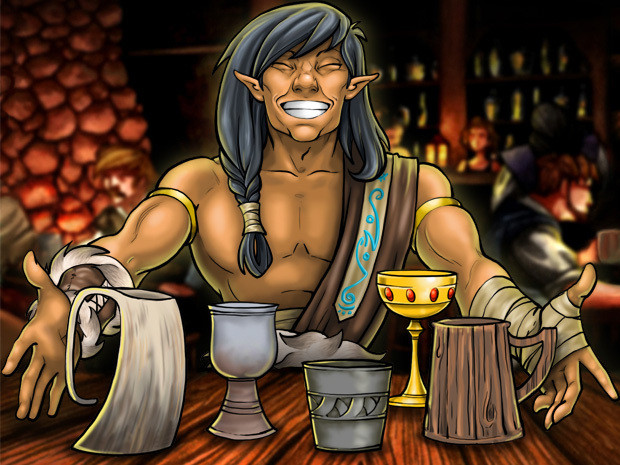 This week we’re talking about combining drink decks in The Red Dragon Inn! Today we would like to discuss one of the small but important aspects of The Red Dragon Inn: the size of your Drink Deck. A Drink Deck right out of the box is a carefully-crafted 30-card force of destruction and merriment that has been both boon and bane to many a party-goer. As more adventurers have joined The Party, so too have new and exciting drinks been added to the menu! Many players have shuffled new drinks into their Drink Decks, either from promos that they have collected over the years, or from the many new drinks found in the various expansions. It seems that not a small number of fans have their own favorite custom Drink Decks or shuffle them all up into a behemoth pile! The Drink Deck should be (about) 30 cards. “Why?” you might ask? Well, simply put, the 30-card Drink Deck is designed to be a game clock. Remember, each time the Drink Deck runs out, each player must pay 1 gold to the Inn. This slow drain on everyone’s gold is very important to the balance of the gold-stealing and hard-gambling characters in the game. Without this occasional, yet reliable tax on player’s stashes, Gerki and the other rogues like him find the game significantly harder to win by way of stealing everyone’s hard-earned gold. There’s another ramification of the 30-ish card Drink Deck. When the deck is eventually reshuffled, there are typically still drinks out on player’s Drink Me! Piles. So, the second time around, the Drink Deck will have fewer than 30 cards in it. Again, that’s extremely important for the gold-focused characters, who benefit from the second shuffle (and sometimes the third shuffle) to pull off a victory. Therefore, when you are playing with these gold-focused characters, they are at a slight disadvantage because all their gold-stealing shenanigans have less of a relative impact on the game. So give Gerki, Fleck, Eve and the rest a chance and keep those Drink Decks pretty short. If you really want to play with a single, monolithic, inebriating drink pile, we recommend the following rules. These rules strike a balance between the fun of a giant Drink Deck and the pain the gold characters will feel if that deck never runs out. Enjoy! Shuffle all of your Drink Cards together. This is the Bar Deck. At the start of the game, make a Drink Deck from the top 30 cards of the Bar Deck. Whenever the Drink Deck runs out, each player pays 1 Gold to the Inn as per normal rules. Instead of shuffling the Drink Deck discard pile, make a new Drink Deck from the top 30 cards of the Bar Deck.